Last year, we went on a trip to Paris with our then-7-month-old baby. It was a long trip to undertake, but we wanted to quickly get some practice at travelling as a family and Paris seemed like the perfect place to do so. And guess what—we actually enjoyed the vacation. Travelling abroad with an infant is a big (huge!) project, but it’s totally doable if you plan ahead. Before leaving, I had tons of questions so I did a lot of research. I came back feeling like we successfully passed a crash course in family travel, so I thought it would be useful to share my experience. 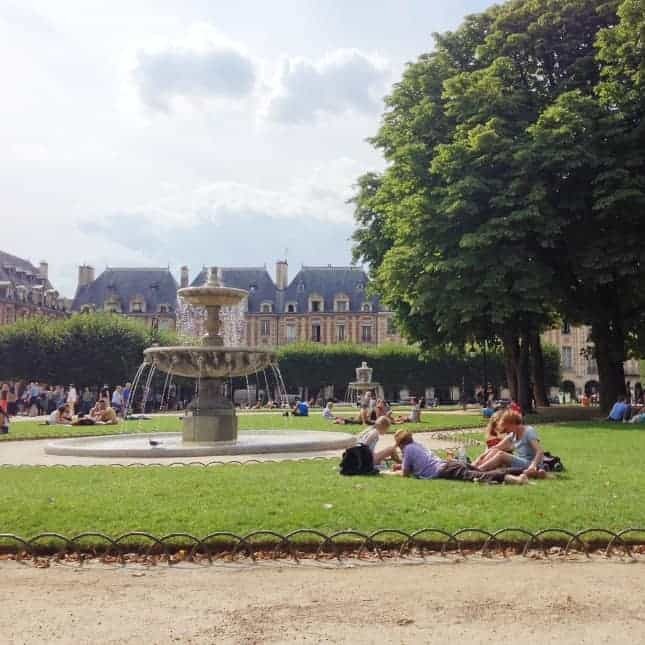 Here’s the post I wish I had read before I left for Paris—with advice that will be useful for any other European destination. Please note that I am NOT sponsored by any of the companies I recommend below. I’m just a nerd when it comes to travel planning and I thought that my experience might be useful to other parents too. 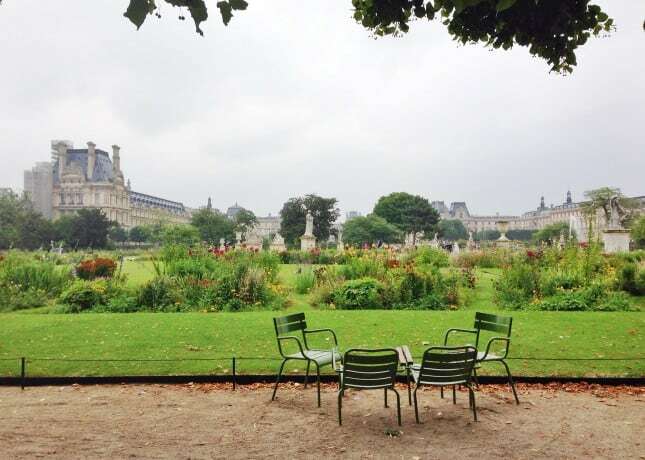 Jardin des Tuileries, a huge, kid-friendly park in Paris. It’s hard to travel light with a baby, but keep in mind that in Paris, you’ll find everything you’re used to buying at home. You can keep luggage weight under control by bringing the minimum number of diapers and wipes and buy formula, purees, and snacks on site. The range of products offered is just as wide as it is in North America, if not wider. Stroller: Before leaving for France, I was curious as to whether our stroller would be too cumbersome to navigate Paris’ narrow sidewalks. Many people (including Parisians) recommend using an umbrella stroller, which is lightweight and folds easily. Some North American strollers are huge, so when considering whether you should bring your own, keep in mind that in Paris, space is always limited (on the streets, in the metro or the bus, in hotel rooms or apartments, in shops or restaurants), so you’ll likely need to open and close your stroller countless times per day. If it’s a pain to do so, you’ll probably want to throw your stroller into the Seine after a couple of days.We didn’t have an umbrella stroller and we wanted to make sure Baby J would agree to sleep on the go, so we chose to bring our own full-size stroller. We own a Baby Jogger City Mini GT, which was recommended by a friend who traveled extensively with hers. 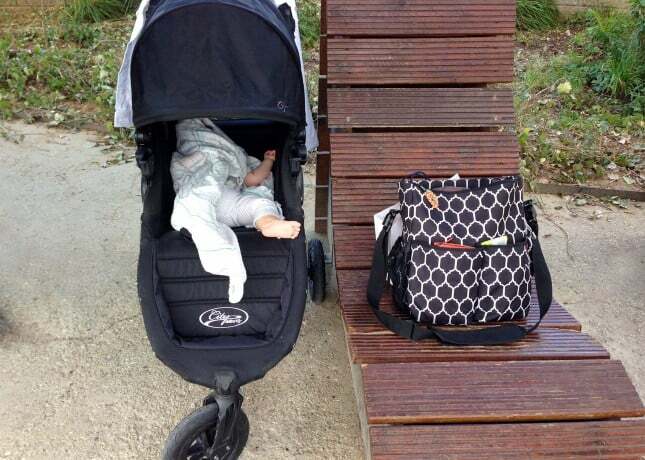 We love it because it’s compact and lightweight, it rides super smoothly (great for cobblestone streets), it has a large (foldable) sun canopy that keeps baby in the shade, it reclines almost completely (making for comfy naps), and—best of all—it folds with one hand. Pull one handle and it closes in a snap. We love it at home, and we loved it even more abroad. Baby J sleeping it off on the banks of the Seine. Baby Carrier: A baby carrier is handy at home but even more so on the road. It’s great to visit places where navigating a stroller is difficult (like museums) or impossible (like walking trails). I also used ours to allow Baby J to take a nap when he just wouldn’t sleep in his stroller. Also, arriving in a restaurant with a baby carrier—instead of a stroller—can also ensure a better welcome (more about that below). Baby carriers are usually quite compact and lightweight, so if you have one, you should definitely bring it with you. Travel Crib: Whether you’re staying in a hotel or an apartment, you may have to bring your travel crib with you. Travel cribs are not always available in Parisian hotels, and when they are, they can be in pretty bad shape. You should always enquire what type (and brand) of travel crib is available to decide whether or not you should bring your own. If you decide to borrow a hotel’s crib, you should still bring your own fitted sheet to make sure baby sleeps in a clean bed.Yes, a travel crib is a pain to lug around the airport, but once it’s checked in, you don’t have to care about it before destination. Most airlines will check it in for free, without it counting towards your weight limit. Some cribs can be very cumbersome even when folded, so if you plan on traveling with baby often, it’s worth choosing one that’s compact and lightweight. We’re very happy with the BabyBjörn Travel Crib Light: it’s as light as promised, it folds into a bag the size of a small suitcase, and it’s installed in seconds. Some babies, like Baby J, find it reassuring to sleep in a familiar crib so for us, it was a given we’d bring our own. We think it helped him sleep through the night for the duration of the trip. Portable High Chair: We swear by our Lobster Chair – it’s the single most useful baby item we own. The Lobster Chair is a portable highchair that clamps to most tables. We started sitting Baby J in it when he was just 4 months old and too tiny to fit in any restaurant highchair. 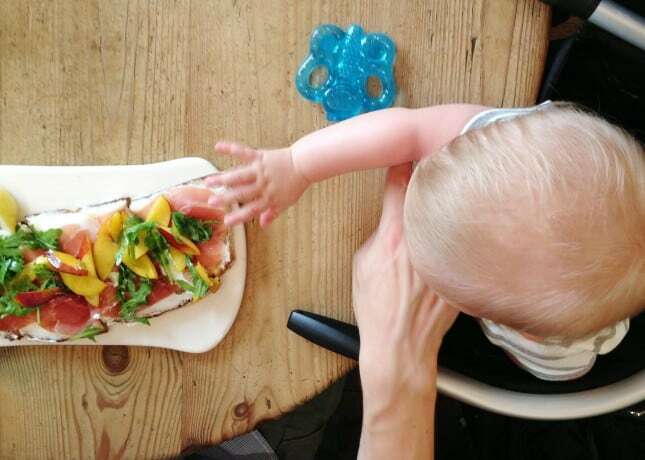 It allowed us to start going out again and have (relatively) peaceful meals, with baby joining us at the table. We carry it with us everywhere we go because it’s lightweight and folds to fit into a small handbag.In Paris, we used it at the apartment and whenever we went out to eat. Parisian restaurants rarely have highchairs, so we would have had to hold Baby J on our lap during most meals—not my idea of a fun time out. We think that because Baby J always sits in the same chair, he’s more comfortable and it makes him more patient, which allows us to eat at a normal pace and have a good time. I simply can’t imagine eating out without it! Baby J comfortably installed in his Lobster Chair at Le Pain Quotidien. Changing Pads: Yes, plural! Changing tables are still extremely rare in Paris; you should simply assume there won’t be any on your path. The only places I used them were at the airport and once in a large department store; everywhere else, I had to change Baby J right down on the floor. Because, of course, bathroom floors are not the cleanest place on earth, you should bring several changing pads, especially if you don’t have access to a washing machine. Another option is to stock up on disposable changing pads. Want to travel light? Rent the baby equipment! Baby’Tems rents everything from strollers to toys and delivers it to your hotel or apartment in Paris. I have not worked with this particular company, but we used a similar service when we travelled to Miami last spring. What’s great is that the baby rental company guarantees the equipment is in working order and clean, provides instructions for use, and picks everything back up before you leave. It’s truly helpful – some might even call it a lifesaver. It’s not cheap, but it can save you lots of trouble. Unless you plan on staying only a couple of nights in Paris, I strongly recommend renting an apartment. I see only advantages to renting your own place in Paris (whether you travel with a baby or not): a lower nightly rent compared to hotels and more space, with the bonus of feeling like a local. Plus, it’s super easy and safe to book with sites like Airbnb and Roomorama, and there’s a lot of choice in all arrondissements, so it’s pretty much guaranteed that you’ll find a place tailored to your needs. The cute (and roomy!) 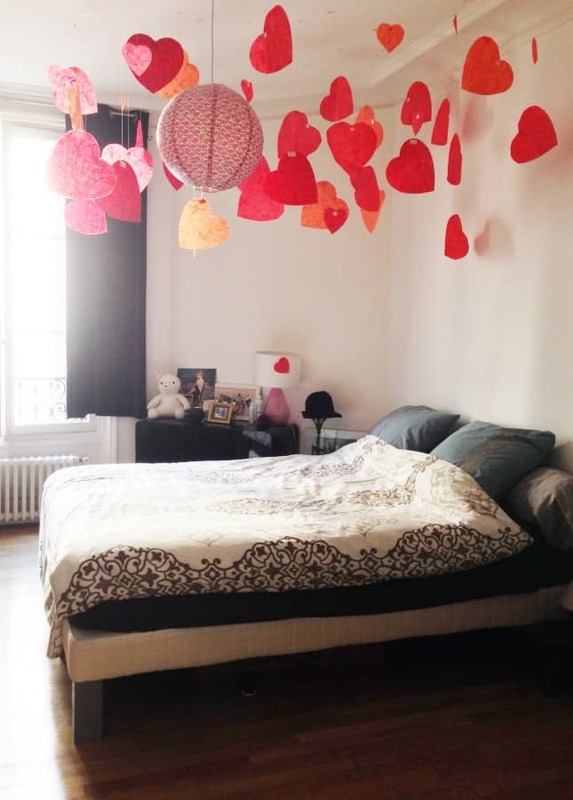 bedroom in one of the Airbnb apartments we’ve previously rented in Paris. Location: A friend rightly told me that, with a baby, the clock starts ticking as soon as you walk out the door. It’s a good idea to stay in a central location, one that will allow you to be within walking distance to attractions, restaurants, and shopping opportunities, so you can make the most of the time that baby accepts being out and about. Floor: Buildings in Paris average five to six floors, and most don’t have elevators. If you don’t want to lug a stroller up and down long flights of stairs several times a day, check the “elevator” box when doing a search on an apartment rental site. Note that you may still have to climb a few steps to get to the elevator and that the elevator will probably be as small as a shoe box—the one where we stayed could only carry one of us at a time and didn’t fit our stroller unless it was folded. Also, Parisian elevators don’t always go up to the last floor, and an elevator that goes up to the third floor won’t be so helpful if you’re staying on the fifth. If details about the elevator are not included in the apartment listing, make sure that you ask the owner to avoid unpleasant surprises. You know you don’t want to face these stairs with a stroller! Bathroom: Parisian bathrooms are often tiny; some have a bath, but no showerhead, others have a standing shower but no bath. Depending on your baby’s age and how you’re used to bathe him, pay close attention to the bathroom pictures to figure out the layout. Even though the apartment we rented did have a full-sized bath, we ended up bathing Baby J in the kitchen sink, which was large enough to fit him and much quicker to fill, empty, and clean up on a daily basis. Washing Machine: You may have never paid attention as to whether an apartment you rented was equipped with a washing machine or not; with a baby, I guarantee that you will. Although we brought lots of washcloths, bibs, and onesies, Baby J went through them at an impressive rate, so being able to do laundry was key. It also allowed us to bring fewer changes of clothes, which left more space in our luggage for all the baby stuff we needed to bring. Note that the vast majority of Parisian apartments are equipped only with washers, and racks are used to air-dry clean clothes. Microwave Oven: Many Parisians don’t own a microwave oven because they simply don’t have the space to put it. Indeed, the apartment we rented didn’t have one, so we relied on the bain-marie method to heat up Baby J’s milk and purees. Doing this several times a day can become time-consuming, so if your baby doesn’t like his foods cold or room temperature, a microwave can be very handy. Air Conditioning: The vast majority of Parisian apartments don’t have AC. In the summer, top floors can become very hot during the day, but on the flip side, they’re breezier at night. Ask whether the apartment’s bedroom faces an interior courtyard, which usually means it’ll be quieter and you’ll have the option to leave the windows open overnight. Or add AC to your criteria when you search for an apartment. Internet/Wi-Fi/Cable TV/Phone: Internet, TV, and phone packages are inexpensive in France, so most rentals include those services (including long distance calls). Ask the owner for details if you have specific requirements. We used to take the RER to get to the city from the airport, but because the Paris train and metro network is not easy to navigate with a stroller (more about this below) and we had a ton of luggage to carry, we opted for a taxi this time. 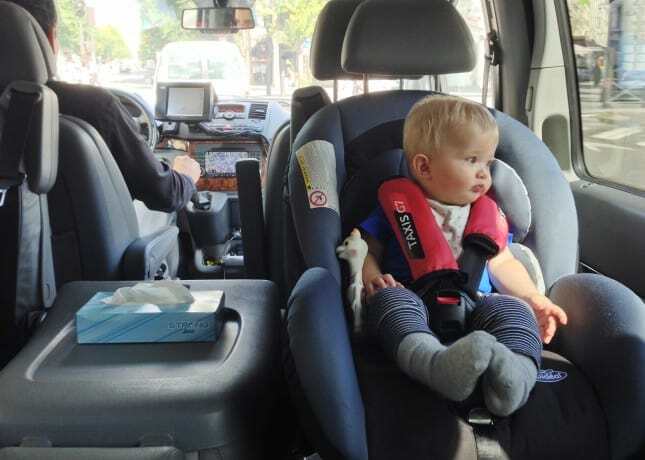 You can hop on a taxi at the stand outside the airport, but Parisian taxi drivers are notoriously brusque, which could make the ride unsafe for your baby. Taxis G7: Because finding a taxi in Paris can be tricky (I have yet to catch one at a designated taxi stand – they never seem to show up), I have long been a fan of Taxis G7’s online taxi booking services. Using their website or the mobile app, you can request an immediate taxi, or book it in advance (both tools give you real-time progress and arrival notification of your taxi). They have now added “Family Cabs” to their lineup, which come equipped with boosters and baby seats. Because there’s a limited number of Family Cabs, they’re rarely available at a moment’s notice so make sure to book them at least an hour in advance. Family Cab drivers are friendly and helpful: they helped us manage our luggage and fit Baby J into the seat so he was safely strapped in. They’re ideal for trips to the airport or the train station, or for any trip you can plan in advance. Baby J enjoying a safe ride. If you need to take a taxi at a moment’s notice, know that you can board a taxi with a baby on your lap. We had to do it a few times for short distances; drivers will take you and your stroller without fussing. Just make sure you hold baby facing you (like you would for burping him) so you can hold his neck and head, saving it from swinging back and forth when the taxi starts and breaks more abruptly. Taxi Baby Seat: The website looks terrible but the service is great. It is best to transfer from the airport to Paris or the other way around. You pay a fixed price (online in advance or in person at the airport) and the driver waits for you inside the arrival terminal holding a sign with your name on it. The drivers are very helpful and the rides are minivans that come equipped with baby seats or boosters to fit your family. Book in advance (a half-day is enough). The Paris métro and train network is notoriously hard to navigate for parents with strollers or people with a physical disability. The vast majority of stations simply don’t have elevators or escalators. Of course, carrying the stroller is doable, but keep in mind that in some stations, you’ll have to climb up and down dozens of steps. It can be exhausting or downright dangerous during rush hour, when you’ll surely get bumped into by hurried travelers. Many stations are being renovated, but because of its configuration and age, the Paris métro will never be fully accessible. One exception: the most recent métro line, number 14, which runs along the Seine up to the St-Lazare train station, is fully equipped with elevators and the métro floor is level with the platform. It’s useful to visit some of Paris’ main sights, such as the Louvre, the Opéra Garnier, Les Halles, Place de la Madeleine, les Grands Magasins, and more. For more information, visit Infomobi, a site that provides details about the accessibility of Paris métro and train stations. Bus: My friend Ann, mom and part-time Paris resident, told me it’s much easier to take the bus than the métro because you’re allowed to just roll your fully opened stroller into the bus. I have not tried it, but I take her word for it. The Infomobi website provides a list of the lines served by buses with a flat floor (but strollers can make it into a regular bus too. )To plan your bus trips, download the official RATP app (available for iOS, Android, and Windows Phone). The site is in French only, but the app is available in English. On Foot: My favorite method of transportation in Paris has always been walking. Wandering the streets, gawking at the architecture, popping into tempting shops at will, and just watching people be are the reasons that I won’t ever get tired of Paris. As a visitor, your schedule’s flexible (I sure hope it is! ), so take your time and get lost for a while. Walking agreed with Baby J, too: watching traffic, bikes, and people zoom by was simply captivating to him. I thought that the noise would be too much for him, but he wasn’t even startled by sirens and horns. We often forget how noisy life in the womb was and how a rowdy environment can actually be reassuring for a baby.As mentioned above, if you plan on walking in Paris, you might want to stay in a central location so it’s easier to head back when baby really needs to be home (they all have their breaking point!). When we wandered farther, we simply hopped on a taxi to speed up our return. A short taxi ride is cheap, and it can save you a lot of grief. There is no space: Most restaurants are cramped. You showing up with the little one and the stroller means that they will have to fit you somewhere, and sometimes, there is simply no space. There are no facilities: Most restaurants have no highchairs (they are too cumbersome) and no changing tables. Washrooms are often so tiny that there is not even enough floor space to lay baby down to change him. There is no time: Many restaurants become packed during rush hour, making servers extremely busy. Some servers simply expect families to be fussier patrons that are bound to add to their workload. 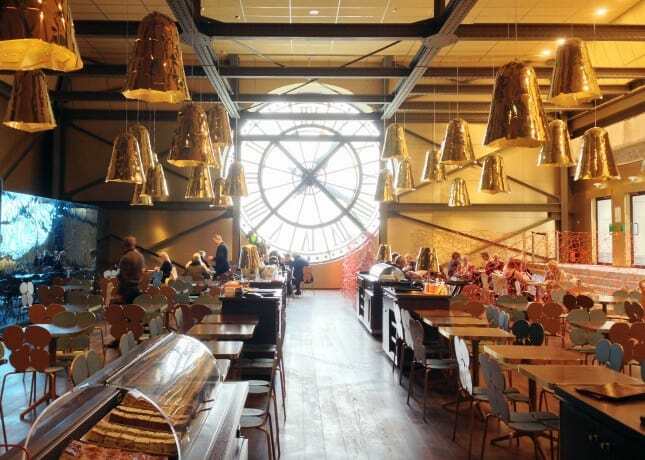 The airy and casual Café Campana at Musée d’Orsay. Survey the space. If you see that a restaurant is especially tiny, with tables so close they’re touching each other, just save them (and yourself) the trouble and go elsewhere. Use your wandering time to scout restaurants. While walking around Paris during the day, take a note of places that seem baby-friendly because of the space, the location, or the menu. Take advantage of terraces. Outdoor seating makes it easier to pull the stroller up to the table, but keep in mind that smoking is allowed, so the air might become hard to breathe at rush hour. Plan off-peaks. Many restaurants (including some on the higher end of the spectrum) will welcome you if you show up at off-peak hours. For lunch, this means at 12 p.m., and for dinner, 7 p.m. is best. If you show up early, servers will have more time for you and food will be served more quickly, too. Pack a picnic. 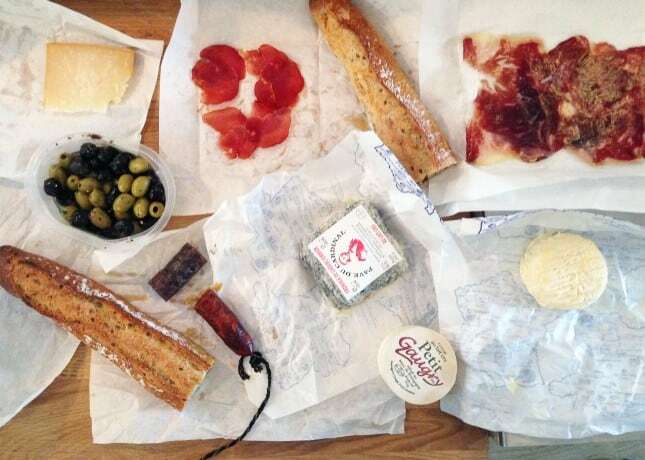 Bakeries, pastry shops, gourmet grocery stores, and farmers’ markets sell outstanding picnic fare. Just add wine. Go casual—or international. 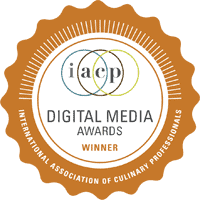 Casual restaurants like cafés, crêperies and bistros, as well as those serving international cuisines (like Chinese, Japanese, or Italian) tend to be friendlier with families. Tour, shop, and dine under one roof. Large department stores and museums offer lots of dining options, including some on the higher end of the spectrum, that welcome families with a smile simply because they’re used to seeing them. They are more likely to have high chairs too (though it’s never a guarantee). Know what to expect. Don’t let the servers’ attitude or the lack of baby-friendly facilities dampen your mood. Come prepared, and you’ll have a much better chance of having a good time! Crêpes, a ubiquitous but sometimes life-saving meal choice in Paris. Le Pain Quotidien: 10 locations in Paris. Excellent for breakfast and weekend brunches, and great takeout treats too. Marché des Enfants Rouges: A fantastic covered market with food from all over the world. Merci: A fascinating concept store with three different restaurants. I’d gladly live in the Used Book Café. If you’re in the area, don’t miss closeby BonTon, probably Paris’ best children store spanning over 3 stories (there’s a photobooth and even a hairdresser on site!). Colorova Pâtisserie: One of my favorite hidden gems in Paris (many thanks to Lindsey for the tip! 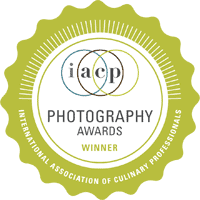 ), Colorova is a beautiful café/pastry shop/tea room that serves outstanding prix fixe lunches and brunches in a relaxed atmosphere. Les 400 Coups: A truly kid-friendly place that pleases parents too. They have high chairs! And changing tables!! And a play space for kids…!!! La Pâtisserie des Rêves at BHV/Marais: One of Paris’ very best pastry shop recently opened an outpost in grand magasin BHV/Marais (hurray!). The dining room is airy and allows you to sample their world famous pastries comfortably (after having a salad or a sandwich, of course). 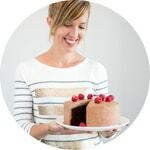 Their Paris-Brest is simply life-changing. A cozy nook at Colorova Pâtisserie. 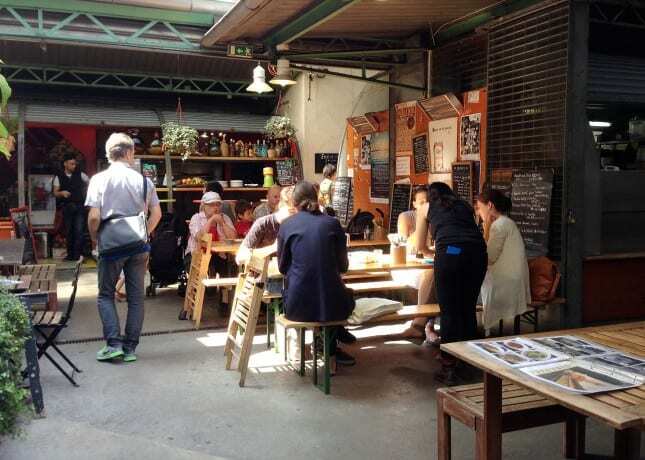 A dining spot at Marché des Enfants Rouges. There are lots of kid-friendly activities in Paris, though baby-friendly ones are less obvious. But, as always, there are solutions. For example, parks feature few grass-covered areas, most off-limits (bring a blanket! ), and I didn’t see any baby-friendly “basket” swings (put baby in the carrier and hop on the swing yourself!). Babies tend to be fascinated by life unfolding before their eyes, so enjoy it while they will follow you everywhere without protest. 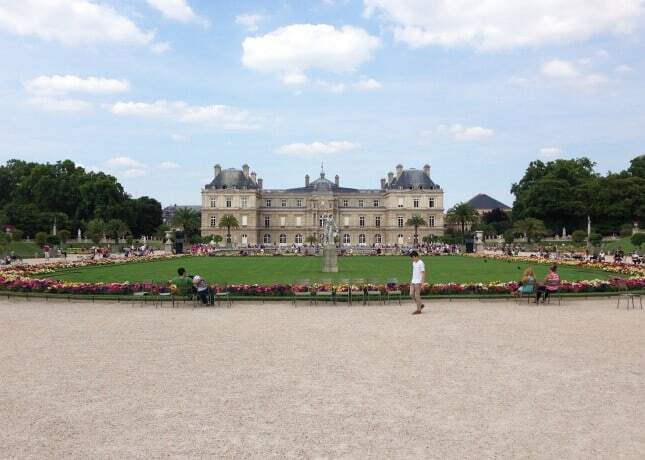 Jardins du Luxembourg, a family-friendly park in Paris. 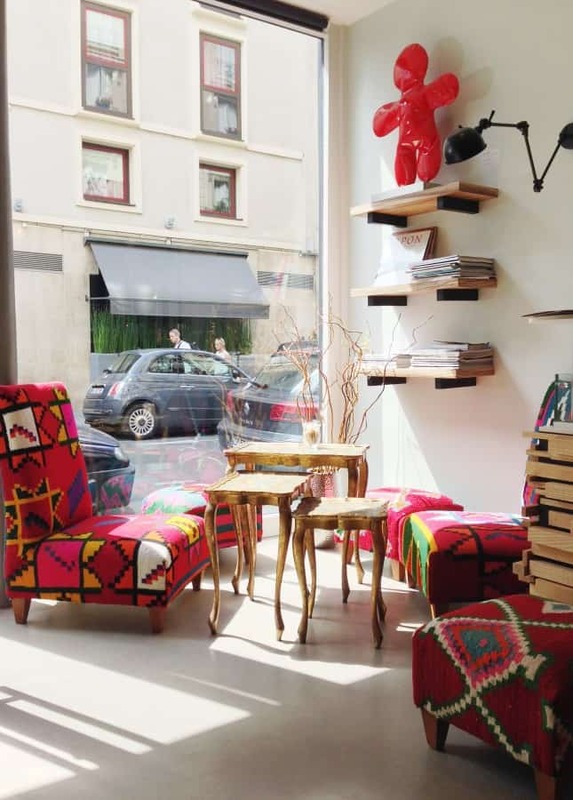 Paris Week: Ten Off-the-Beaten-Track Places to Take Kids, by Ciao Bambino! 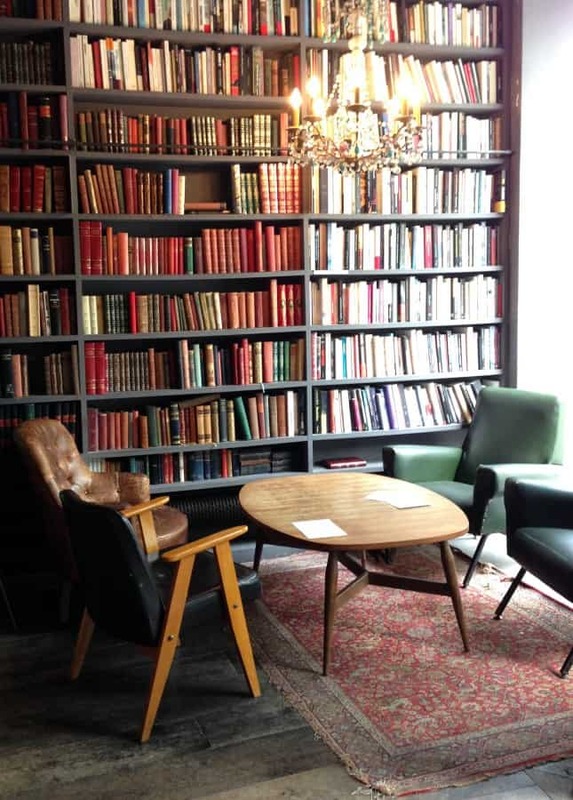 The cozy Used Book Café at the Merci concept store. Have you traveled to Paris with a baby or with kids? Share additional tips, activity ideas, and restaurant recommendations in the comments section below! Full disclosure: This post contains affiliate links. 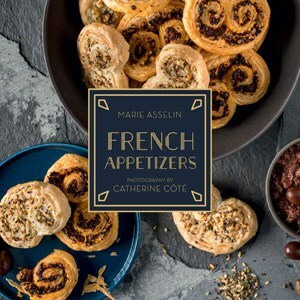 When you buy tools, ingredients and books through links on my site, I am earning a small referral fee that helps me keep on producing quality content for Food Nouveau. Thanks for your contribution! 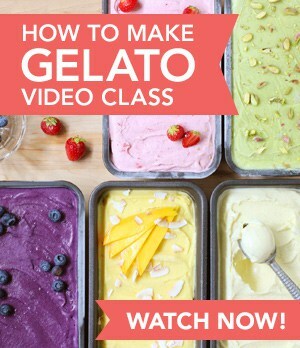 Thank you for your tips! I am planning a trip to Paris next spring with my 8 months old daughter by then. Without your post I would not have known there are portable high chairs (also in fabric) and that the real ones are so rear in Paris. Actually, it is not very European not to have them. And my mind is better set for a creative diaper-changing now. Thanks for your post! It’s really helpful. Though we have been to Paris many times before, but we have never been there with a baby!! Thanks to all of your advices. Paris is such a great destination to get your footing traveling as a new family. Plus, it’s magical in December! You’ll have a great time, and everything will go well, I’m sure. Just remember to be patient–and always be ready for last minute change of plans! Make sure to come back to let me know of any new baby-friendly restaurants or activities you discovered during your trip. Hi Marie, I like many that have read your post THANK YOU! I will be traveling with my 7.5 month old in November. It will be her first flight, and just like one of the responses you gave – I won’t put that much pressure on myself. I thoroughly enjoyed reading your post, learnt a few things and can’t wait to try the recommended places -especially those to eat. I’m so happy to help! Been there, done that. You have the right attitude and I’m sure you’ll enjoy your trip. Please report back if you make new and interesting family-friendly discoveries in Paris! Must give it to u. !! Such an awesome post. We are dreading our first family vacation with our 9 month old daughter. This post was awesome. Such an awesome post!! This is perfect. We are thinking of traveling with our 15 months old daughter and this seems like a life saver!! Question – How many days would you recommend we stay in Paris? I’m a big fan of not running through a vacation–especially not with a baby. If you like to take things in, have time to wander aimlessly, and feel like a local, I would recommend a week in Paris. Anything more than that is bonus! But in a week, you’ll have time to see the main sights, eat lots of pastries, and get a good feel of what Paris is all about. Hope you enjoy your trip! Your post really helped me plan our recent visit to Paris with our 9 month old baby. Thank you!!! > For take off and landing, bring a pacifier (or many, in case she drops it), or bring chewable toys so her ears don’t hurt. My son didn’t use a pacifier and wouldn’t chew on toys, so I made him eat or snack during take off or landing. I brought small cups of different snacks (rice cakes, raisins, tiny cookies, etc.) so there was a novelty aspect to each snack. > Bring a variety or inexpensive new toys and books (you can get those at the dollar store) to keep your daughter entertained–and it won’t be the end of the world if you loose any. > There’s unfortunately no easy way to make a baby sleep on a plane! My son was super stimulated by all the lights and sounds and people that would wave to him, so it just always takes me a really long time to put him to sleep. Don’t hesitate to ask agents to let you him the front of the plane section (where they prepare meals for the business or first class). This section is usually quiet during flight because they close it with curtains, so it may be easier to rock your baby to sleep there. If you can’t get to that section, use the washrooms! There’s fewer stimulation in there and people can always use other washrooms if you stay in for a while. > Bring lots of soft blankets, so you can cover the seats with some, wrap your daughter in others, and possibly partly cover her eyes with her favorite if and when she’s sleeping. I found blankets where great to make my son sleep longer because I could shade his face from bright lights. > At the beginning of the flight, look for the flight attendants who smile at you and your daughter and remember who they are (because there are many who seem to be annoyed by babies). Then, when you need anything on the flight, ask those agents to make sure you’ll get the help you need! Some agents can be downright rude to parents. > Know that most North American carriers are not allowed to heat up milk or formula anymore (I think it’s the lawsuit scare, in case they heat anything up too much–it’s really annoying). They will give you hot water though, so if you feed your daughter formula and she doesn’t like it cold, make sure to bring a larger plastic container you can pour the hot water in, then set the baby bottle in the hot water without splashing around. But first and foremost: Don’t put too much pressure on yourself or your daughter. Expect to get no rest or sleep, but be happy if you daughter does! (I consider flying with my son an intense workout!) Ignore evil stares from people, you paid for your seats, so you have just as much right to be there as they do. Bask in the congratulations of people who tell you your daughter is doing well, the kind people who Go expecting the worst and you’ll probably be happily surprised at how well she does. 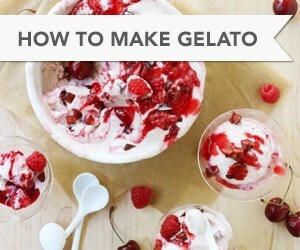 Hope these tips will help. Good luck, and report back to tell me how it went! What an awesome post! My husband works in Paris and once a year and I try to join for a week. The next time will be with our 16month old and this will come in very handy! Thank you! Happy the timing is good for your next trip to Paris. You (and your 16-month-old) will have a great time, I assure you! Let me know if you discover new baby-friendly spots while you’re there. Great post! I do wish I had read this before we went with our 5 month old! However, we found our trip to be pretty manageable and did a lot of the same things as you. That’s so cute! I love the Je T’aime pieces! We ate at Relais de l’Entrecôte Saint Germain which was surprisingly baby friendly. We also went to Chez Omar, Cafe Breizh and a few other brasseries. I wanted to update the link I provided above to the new website. Thank you for this post! It is so helpful! You mentioned that you took your city mini GT for the trip. I was wondering it you had to fold it or if it fitted the exit doors on the metro stations. I’m going there next month and would love to bring my stroller but will need to use the subway. Hello Marianna! Many metro stations do have a wider exit door that swings open for wheelchairs, which of course work well for strollers too. When there is only turnstiles, we do have to fold the stroller to get through. I feel like you’d have to do the same even with a more compact umbrella stroller because it would get caught in the turnstile, which only allows for a standing human to go through! Other metro stations have “vertical turnstiles,” which really don’t work with strollers, whereas others (that don’t have wheelchair gates) have paygates that swing open (instead of turnstiles), which are great for strollers. I would not buy a different stroller only to make sure it’s compatible with the metro system because each station is different from the next. There’s no guarantee any stroller would be compatible with the commute you’ll need to do. It’ll always be an obstacle course anyhow :) Good luck! What a wonderful post Marie. I can’t imagine traveling with a baby. I am very impressed by your planning and how you managed to have a wonderful trip with an infant. Also, I completely agree with your recommendation of Patisseries des Reves – it’s my most favorite pastry shop in the world and I dream of the Paris-Brest often. I also ate at the cafe in the Musee d’Orsay – the food was nothing special but the space is so gorgeous! Wonderful advice!! We are very excited to return to Paris with our 17 month old after living there several years ago. Can you share the information on the apartment you rented? It was great all around (HUGE kitchen by Parisian standards!) and the hosts were super helpful too.